Buy this item and earn 699 ClubPoints. 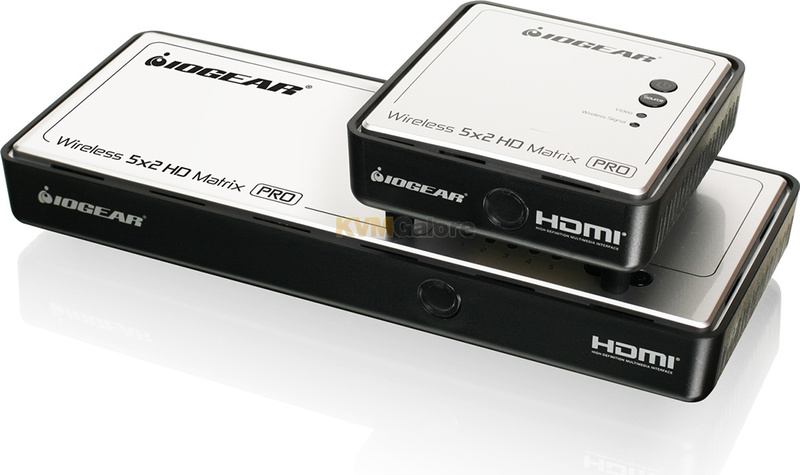 IOGEAR's Long Range Wireless 5x2 HDMI Matrix PRO with Multicast is the first to send uncompressed Full HD 1080p up to an astonishing 200 feet*, including the ability of multicasting up to a total of 4 wireless HDMI receivers. 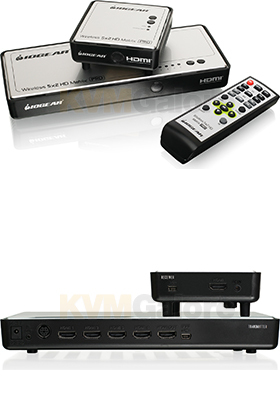 Natively the kit consists of a Transmitter with connections for HDMI and Component (5-port switch / matrix) and a wireless receiver. It also provides a loop through (local port) on the transmitter for an advanced 2 HDTV set up. 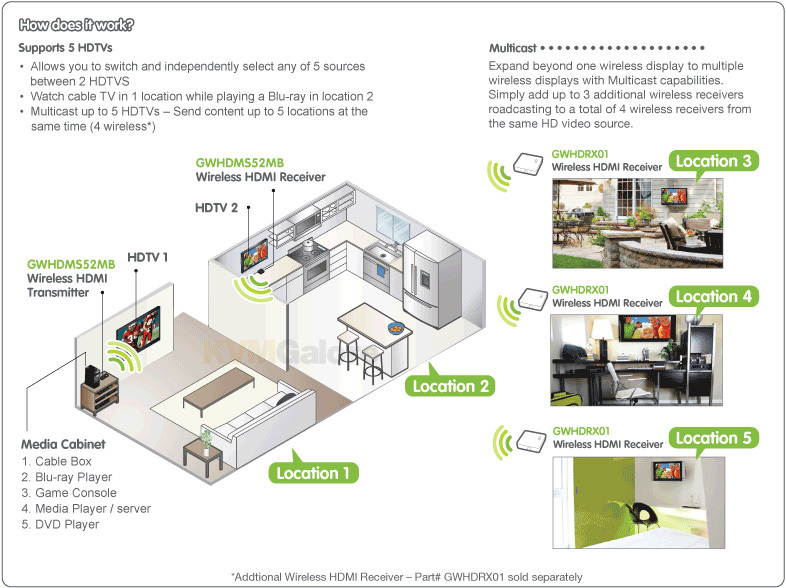 The wireless matrix feature allows a user to switch and independently select any of 5 sources between 2 HDTVs, creating 2 completely different audio/video environments. The Long Range Wireless 5x2 HDMI Matrix PRO is setting a new standard in wireless connectivity, flexibility, convenience and dÃ©cor. The wireless matrix feature is the biggest breakthrough in wireless A/V solutions today. This means you can watch cable TV in the living room while the bedroom independently selects a Blu-ray® movie to watch wirelessly at the same time. It's capable of streaming uncompressed Full HD 1080p with support for 3D content and digital audio up to 200 feet* away within the home or desired set up. Expand beyond one wireless display to multiple wireless displays with Multicast capabilities. Simply add up to 3 additional wireless receivers broadcasting to a total of 4 wireless receivers from the same HD video source. IOGEAR's newly designed discrete remote gives installers and prosumers the flexibility to consolidate functions with professional A/V systems. Supports IR pass-through - Use remotes from your current source devices such as a DVD / Blu-ray players, DVR / cable boxes, A/V receivers and media streaming devices such as Apple® TV to design your own custom entertainment space. The default EDID resolution setting is 720p, to ensure HD video on every initial set up. The PRO unit provides three (3) EDID management modes for the best installation every time. This gives flexibility and power for any install or end customer's desired set up. • EDID 1 Mode: Changes the default setting to 1080p Full HD. • EDID 2 Mode: Refreshes the screens and sets the highest common resolution of ALL the connected displays. Take re-decorating, retrofitting and designing to a new level of creativity and convenience. Ever wanted to set up another HDTV in the bedroom, kitchen, den or patio? Now you can have an HDTV in almost any room of the house. Set up the HDTV in the back patio for sporting events while the kids play video games or watch a Blu-ray movie in the living room! The Long Range Wireless 5x2 HDMI Matrix PRO does not require a line-of-sight placement, keeping home theater devices neatly out of sight, which enables a quick, simple, and flexible wireless HD or 3D audio/video solution. 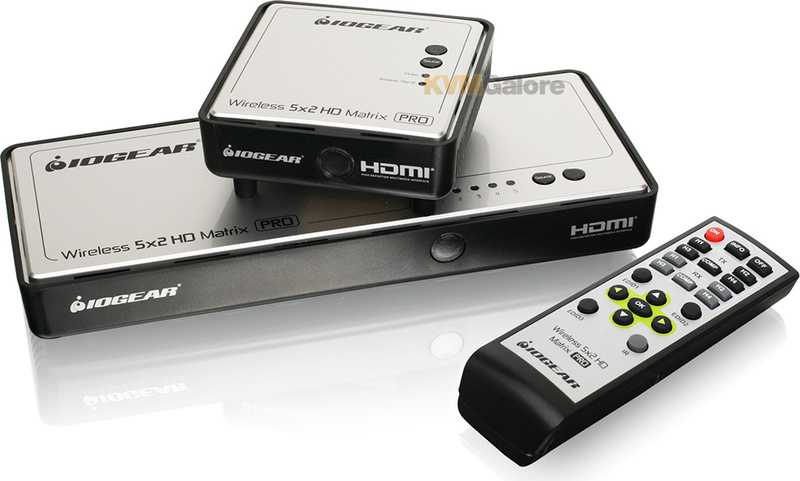 Listed below are additional products to consider which are compatible with Long Range Wireless 5x2 HDMI Matrix PRO. These items may be required to complete your system.